Cornish Blooms is a small family run flower farm, we grow flowers twelve months of the year which we can send by post throughout the UK. 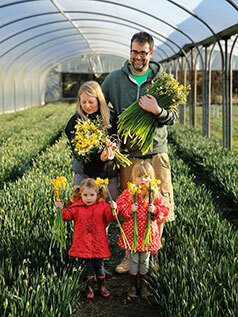 Cornish Blooms have taken over Cornish Flowers.com and continue to send fresh Cornish Flowers throughout the UK. We wish Nancy and Paul all the best for their retirement. Please feel free to browse our website. You can buy our flowers online from the Home or Shop pages.